It gives me great pleasure to share with you High Frequency Words from the Quran and its wisdom everyday. Previously you’ve learned 53 High Frequency Words from the Quran, yesterday’s HFW being (أَمْر) . The HFW you will learn today is repeated for 176 times in the Quran. As of today you’ve learned 54 words from the Quran. Collectively these words are being used for 6144 times in the Quran! MasyaAllah! Let’s continue reading! Today we will continue learning the HFW and today’s HFW is Number #54. We will start sending you number #1-#53 via a link through the email you’ve provided once our system is up and running. 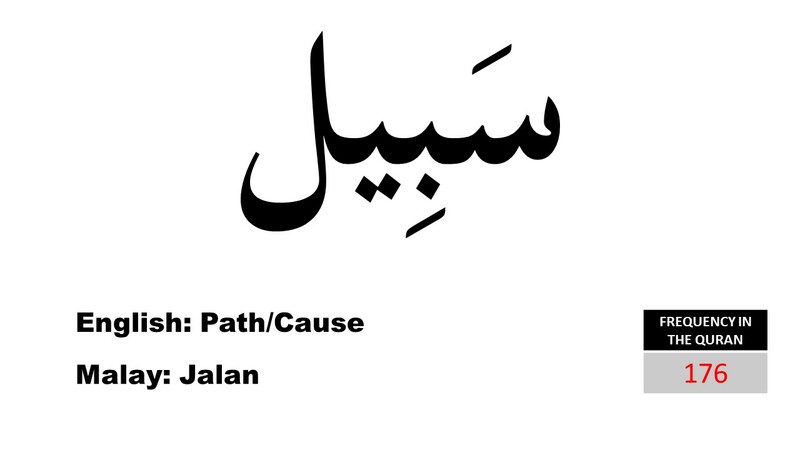 Today’s HFW is (سَبِيْل) which means “PATH” or “CAUSE”. Life is a journey, and there are many paths. We can choose any path we wish. But the most noble of paths is the path of Allah. This path, it’s destination is redha Allah, to attain the pleasure of Allah, and it leads to jannah, the eternal paradise. When the destination is far and the journey is hard, we must be very clear of our objective. Only with clear objective will we be consistent in our path and we are able to go through in harmony. Therefore, in our journey we must always, always remember what we are seeking. We seek the Rahmah of Allah, this world is nothing and the Rahmah of Allah s.w.t. is everything. And everyone with sound mind, is in this PATH of seeking His Rahmah. Imaan, or faith, is very important, it’s important in life because it influence or actions, and our actions effect our situation in hereafter, therefore develop our imaan and have faith in the rahmah of Allah. To register for I Want To Live With Quran in 2015, a program for those who want to read and understand Quran please visithttp://aspireinstitute.com/quran2015 . May Allah bless this world and our Quranic Growth Ameen! Please let me know what you think, and leave some comments below. I love to read them. Thank you for reading!